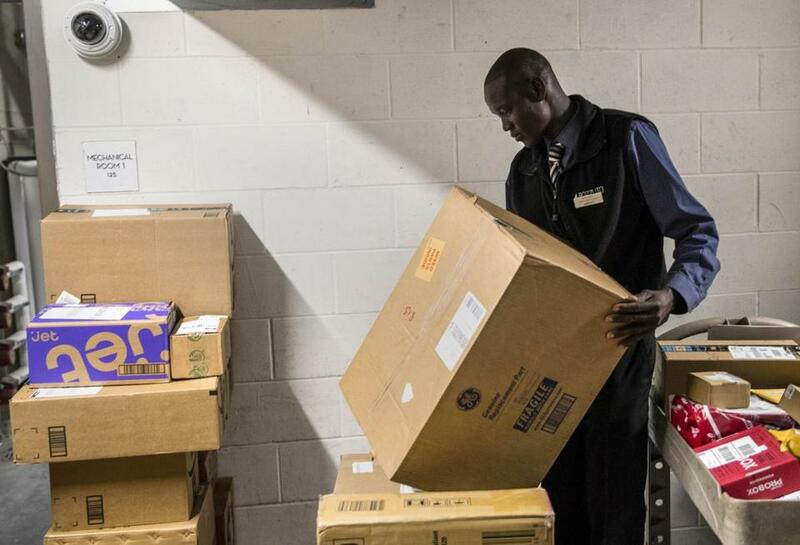 Mou Riiny, who acts as the box concierge for the Kennsington building, moves boxes to be delivered to tenants in the building&apos;s mailroom. Larry Lawfer is just an ordinary guy trying to get along in life, but he’s got one job that’s breaking his back: dealing with the never-ending stream of Amazon boxes. As soon as Lawfer, a real estate agent from Milton, finishes collapsing one empty package and schlepping it to the end of his driveway, there’s the FedEx driver with another box for his wife or his son. “I’m like Sisyphus,” he said. We Americans apparently love nothing more than sitting on our couches, binging on Netflix, and shopping from our phones. But all those groceries and chinos and garden sets we summon to our doors are generating a great surplus of cardboard that no one can seem to get rid of fast enough. The convenience is starting to become inconvenient. The cardboard tsunami is forcing residential building managers to reconfigure staffing and lobby space, and triggering actual emotional stress, as packaging overflows recycling bins and crowds living spaces and garages. At The Kensington, a swank downtown apartment building, the volume of incoming parcels became so intense that management had to hire a full-time employee to deal with the onslaught. “Sometimes I feel like I’m working in a warehouse,” said concierge Steve Gonzalez. There are lots of ways to measure the growing cardboard menace. One is by the number of packages being shipped in the United States: In 2016, domestic parcel volume hit 13 billion, up from 12 billion in 2015, according to Pitney Bowes, a global technology company, with even giddier growth forecast for the future. We can also take a look at what happens to all these boxes on the other side, when they show up in residential recycling. Since 2013, the volume of cardboard has grown by about 6 percent at Casella Recycling’s Charlestown facility, which handles waste from 75 municipalities in Eastern Massachusetts and Southern New Hampshire. “We call it the Amazon effect,” said vice president Bob Cappadona. Here’s another view on the problem: A growing number of buildings are turning unused game and party spaces into areas with self-service electronic lockers, where residents retrieve packages left by delivery people. His firm, one of several in the field, including Amazon Locker, installed its first lockers in 2013, and has done more than 1,100 in 35 states. But some buildings, like Element in Allston, are already outgrowing locker space that seemed ample just recently. Element management had assumed 20 percent of residents would receive packages weekly, said property manager Stephanie Cabral, but the number has been twice that. “People love online shopping,” she said, noticing two boxes of dog food taking up space in the lobby because the lockers were full. You wouldn’t think people would get emotional about cardboard, but in some families, the collapsing-the-boxes chore has replaced leaf-raking as the chore to fight over. In Melrose, condo resident Cindy Campbell said her building’s new no-boxes-in-the-dumpster policy had her begging for space in a friend’s condo’s recycling bin. “I don’t want to go on record saying that I’m sneaking into someone else’s dumpster,” she said, ashamed of what boxes have turned her into. Kim Ring of Wakefield spent a month avoiding her home office because it was packed with empty boxes she hadn’t gotten around to collapsing. The only time she went in was to retrieve dumbbells she kept in the office closet, accessible via a narrow tunnel through the empty packaging. Some are so seduced by the ease of e-commerce they shop even though they feel guilty when a tiny order arrives in a ridiculously large package, too often surrounded by protective bubble wrap even when the item is a paper folder, say, or socks. “Amazon sends a jewelry box in packaging that could contain a ride-in car for a child,” said Amy Tierce, vice president of sales and marketing at Mortgage Equity Partners, in Lynnfield. OK, so maybe things will get a bit better in some distant future. But in the meantime, let’s return to downtown Boston, and the Kensington’s parcel-storage room, where it was mid-afternoon. Boxes were everywhere — stacked on shelves, piled on a cart, jumbled on the floor. Amazon, FedEx, and USPS had already left, and UPS was still to come. “They’ll drop another 70 boxes,” said Gonzalez, the concierge. A man who rarely shops online himself, he now has a front-row seat to the mass and madness of e-commerce. “You can get a mattress in a box,” he said, sounding a bit surprised. He pointed to one leaning against the wall.